Climbing is for everyone. And it will solve pretty much all of your problems. This is not a statement that I make lightly. I have climbed with blind people. I have climbed with those who have no lower limbs. I have climbed with toddlers, teenagers, pensioners, and everyone in between. I have climbed as part of a team and I have climbed alone. And that’s just at my local indoor wall. Climbing is one of those special things that forces you to focus on the moment. It forces you to live right here, right now. Because if you don’t, well, you fall. And it is that very thing – falling – which will make you a better, well-rounded person in every-day life. Falling brings people together. The climbing community is unlike anything else I have ever found in life. It is honest. It is humble. It is more supportive than you could imagine. It is diverse, it is willing to learn, and it is definitely willing to teach. The sport seems to demand it, really. I mean, the only way to learn how to climb is to do it. And by definition, learning often involves failing, which in this case involves falling off. In this way, climbing can build confidence. It builds endlessly on psychological factors in how far you can push yourself, fighting the instinctive and inherent fears involved with falling, and in building trust and good relationships in those you climb with. You would be amazed how much it builds physical strength and co-ordination, and yes, in places you wouldn’t expect! It is not too expensive. It is not restrictive. It is beautiful, it is inclusive, and it is personal and respectful, and for a lot of people it becomes a way of life. There are many different types of climbing – definitely enough to suit all needs and types, and each has its own quirks and nuances and differences, and each also receives the respect that it deserves from the climbing world. Bouldering is typically climbing on boulders (go figure), without any ropes. This means that often routes can be quite short, with quite powerful and/or technical moves. Bouldering has two ‘spin-off’ disciplines. One is called ‘high-balling’, which is where the boulder is particularly tall and so the route is especially long in length for a boulder, making any potential falls and landings dangerous. Particularly if bouldering outside, a ‘spotter’ will be used by the climber. A spotter is a person who stands near to the climber, prepared to support the climber if need be or push them towards a safe landing or landing position if they fall. The other spin-off of bouldering is called deep-water soloing, which is the same type of thing again, but done above deep water. This means if you fall off the climb, you fall into the water and not onto the ground (or a crash-pad!). Sport climbing is where someone has placed protection into the rock already in the form of bolts, in a fairly even spread over the length of the route. To this end, the routes are often much longer than bouldering routes, and allow many different types and locations of rock to be accessed. The bolts are then clipped into by the lead climber using a quickdraw (a set of snap-gate carabiners joined together by a dog-bone shaped piece of tough material, usually either nylon or dyneema,). One end of the quickdraw gets clipped onto the bolt, and the other end gets clipped onto a rope attached to the climber’s harness. A belayer at the base of the climb will then use a belay device attached to their own harness to protect the leader if they fall, and to lower the leader after they have completed the climb. This is a device which can use frictional forces in order to stop the rope from moving, and thus ‘catch’ a fall. Trad (traditional) climbing is where there is no pre-placed protection in the rock. All protection is placed by the lead climber as they climb the route. This involves placing different sizes and shapes of bits of metal (called nuts or hexes depending on the shape, and cams which have a movable head that gets placed in the rock), and sometimes slings (a loop of tough material, either nylon or dyneema). Once the climber has finished climbing the route, their belayer normally ‘seconds’ the route, removing all of the gear placed by the leader as they go, and being belayed from the top of the route by the lead climber. Alpine climbing is an art form which can see people spend many nights on a mountain, and sometimes weeks on a single wall or cliff-face alone (a form of this can be seen in ‘Big-wall climbing, such as climbing El Capitan in America). 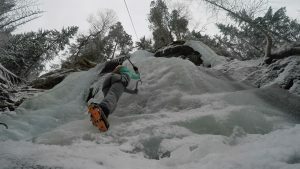 It can often involve ice climbing, where ice screws are wound into the ice to provide some protection for the climber, who uses ice axes and crampons (spikes for mountain boots) to bite into the ice and hold the climb up. It also often involves crossing glaciers, crevasses, and snow fields, and sometimes aid climbing, which is where the route is not climbed using hand and foot placements, but climbed by ascending the rope as such, instead of the rock. If you are not aid climbing, you are seen to be ‘free-climbing’. 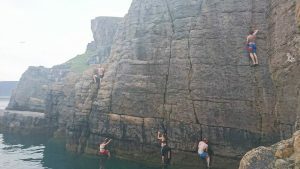 Outdoor climbing is obviously based around the naturally formed rock, so you do not have a choice or say in what the route is like. However, indoor walls can be made to various shapes and sizes, and holds (often made by moulding resin and plastic, but also sometimes wooden) can be multiple sizes, shapes and colours, and placed in any arrangement you can think of. 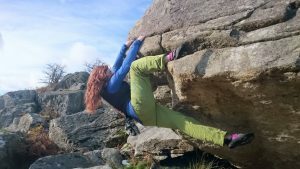 ‘Pulling on plastic’ is very different to being on real rock as outdoor climbing is much more three-dimensional than indoor climbing, and more open to accommodating different climbing styles since it is not as obvious where holds are, and of course, you can’t really climb outside in the rain. There are many different types of rock, and many different types of routes, so be sure to try different types of rock at different crags and in different styles (this goes for indoor climbing, as well!). For example, an overhanging juggy route may be just up your street, but your local crag is slabby slate which is tiny finger crimps, and this can put off those just starting out. 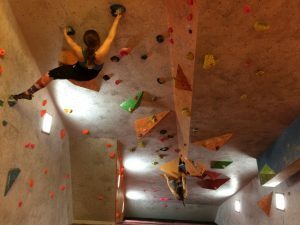 Sport climbing (both leading and top/bottom-roping) and bouldering (sometimes simulated deep-water solos, either over a pool or over a foam pit) are the most typical types of climbing available at indoor walls. Some walls can provide indoor, artificial ice walls for ice climbing, or even walls for dry-tooling. This is where climbing axes are used not on ice, but on rock, and can lead into mixed climbing (a route which has a mixture of rock and ice on it). If indoors, normally wooden holds and features are used for axes (no crampons), or wooden axe handles with material loops on the ends of them get hooked over indoor climbing holds to simulate an axe placement. 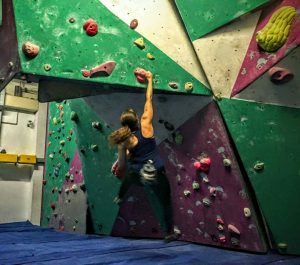 With indoor climbing, a route is seen to be completed if you place both hands (in a controlled manner) on the highest hold of that route, without falling off and only using the intended climbing holds for that route (i.e. only use one colour of hold within a certain area on the wall). If you can do it first time, it is called a ‘flash’ in bouldering, and an ‘on-sight’ in sport and trad climbing. If it takes you a couple of goes, it is a redpoint, and more than that makes it a project. Projects aren’t often possible with indoor climbing as the routes will be reset frequently and so your project will no longer exist! 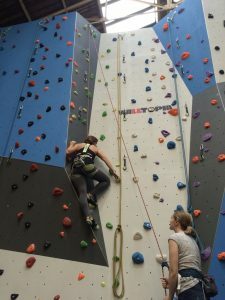 In the U.K., almost every indoor centre will let you start bouldering with no prior knowledge or experience, and most will hire out specific climbing shoes as well. These help to bind your toes together so that you can place more weight and pressure on certain parts of your feet, and also provide better grip because of the rubber soles. It is widely accepted that helmets aren’t required for most indoor climbing – in fact, they can make it more dangerous than without, as they can catch on holds, so don’t worry too much about wearing one. If you want to learn how to belay and use ropes however, climbing centres will not allow you to do so without a test. This can include pictures or statements where you must be able to explain what is incorrect in the scenario, and displaying that you can successfully tie the correct knot for attaching the rope to your harness. If you have climber friends, they will often be allowed to supervise a couple of people at a time whilst using ropes and harnesses, so I would suggest getting them to teach you some things if you wish to take up route climbing. Otherwise, most centres will provide ‘Learn to Climb’ courses which will teach you the basics of climbing and safety whilst climbing indoors, but these can be expensive. If you want to learn and improve technique quickly however, focus on bouldering. If you are interested in gear, strike up a conversation with any of the staff at your local wall, or simply search online. 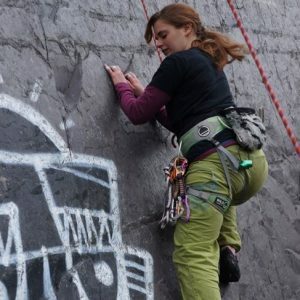 There are many climbing community forums, sites and pages, such as UKC, BMC, and Climbing! The first few times you start climbing, the place you will feel it most in your body is your forearms. This will decrease over time and you’ll find quite quickly that gains are made – you can start staying on the wall for longer periods of time and being able to grip and hold onto different things. So stick with it and don’t be put off too quickly! The community will quickly welcome you in and for most of us, it becomes a way of life. Climbing is an easy way to build strength, balance, co-ordination, confidence, and communication. Really, the only way to get better at climbing is to climb, so get out there and have fun! It might just change your world.